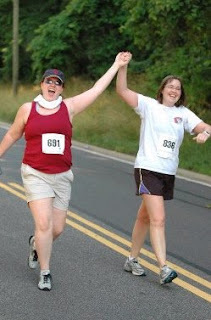 A few years ago, before I tried to become a gym rat, I had the ridiculous idea of running a 10k Race (Lawyers Have Heart). I thought my office was going to have a group of people walking together, but as it turns out all the people that signed up for the race were runners/joggers. Lucky for me, my coworker/softball teammate said she'd stick with me. We started together, we ended together. There was some jogging, some power walking, and lots of talking about her upcoming wedding, our families, and our health. It took 1 hour, 29 minutes to go 10k. We beat people who were jogging. We didn't get hauled away in the van of shame. And amazingly, we were 30 minutes behind a coworker that was a former marine. Is it fast? No. But did it prove something to myself? Yes. I can complete things that are hard. I can't even begin to tell you how much it means to have someone willing take a journey with you. 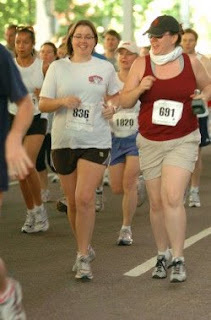 When I did start going to the gym, my trainer was the one telling me I could run on an elliptical for a kilometer. He was there telling me I could run for 5k. And he was the one i wanted to tell that I did 10k in 52 minutes. When doing planks got hard (as we later figured out it was my back problem rearing its ugly head) he would get on the ground and do them with me. He wouldn't bark at me to do lunges without doing them himself. So while you're all not here with me as i'm going through this, I know that I'll get strength from you, motivation from you, and you all will help me stay honest with myself. I'd like to thank you in advance. Finding out that you can do something that is hard... is amazing. I've recently done that too. I walked three miles for the first time in my life without someone with a whip behind me. It gave me the boost I needed to start jogging. It IS hard to push yourself to be physically active. When I was growing up, I had coaches who constantly reminded me that I CAN do the task and just need to put my mind to it. Learning that at a young age helps but it's something that can be learned at any age. One good thing to remember - when it's time to work out, think how good you will feel when you're done. Starting the workout is the hardest part, finishing it usually feels great. I remember being in elementary school, being barely able to run a mile run. My lungs couldn't keep up with the need for air. I don't think I was asthmatic, I just don't think I had any endurance. Back then I could walk a mile in 15 minutes. This greatly disappointed my gym teacher. I also remember the first day on the elliptical with my trainer. After five minutes I wanted to quit, but my trainer kept me on there for 10. I had the same reaction with walking the mile as I did staying on the elliptical for 10 -- "Okay, well that didn't kill me." I have a strong competitive streak (anyone who plays softball with me will know that). And that's what kicked into gear at the gym. I can envision the future me all I want, but I'm all about hard numbers -- being able to run one km more, being able to do one extra set, to lift five more pounds. That's achievement to me -- not starting something, but finishing it victoriously and feeling like I earned a spinach quesadilla. The other thing that echoes in my mind is something they tell people who have panic attacks -- "this feeling will pass" or "In 15 minutes I'll be okay." For whatever pain I was in, I knew it was a temporary thing (HAH!). I knew there was a light at the end of the tunnel and the pain meant that I was asking my body to actually work. I misinterpreted that pain. I was in actual, irreversible pain. I'm more cautious now. I take longer to recover. I'm working with my body instead of against it now. We're at peace with each other.